Who needs to go out for New Year's Eve? 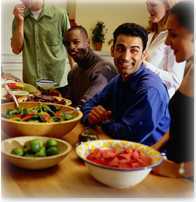 Celebrate family style, with an easy appetizer party right in your own home! Many of us are choosing to stay home on New Year's Eve and celebrate as a family, rather than hire a baby-sitter, go out and then worry about others on the road. So check out this casual, fun evening for familes to share--good food, activities and plenty of memories from the past year! Cut stars from white construction paper for each member of your family. Ask each person to write a New Year's resolution in the center of the star and five special things they are most proud of for the past year near each point. Glue straws or wooden sticks (available at craft stores) to the backs of the stars and decorate around the writing with colored glue and glitter. When dry, place them in a foam block and cover the block with colored shredded crepe paper (available near wrapping paper supplies) to use as a centerpiece. 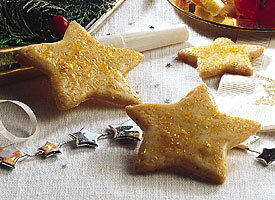 Sponge-paint stars on bright blue or white napkins, using gold or silver paint, for your sparkling celebration. Instead of eating at the dinner table, why not have your celebration meal at a coffee table? It's cozier and more intimate when everyone is seated on the floor (sit on pillows, if you wish!). As you wait to ring in the new year, play "Do You Remember When" about events that happened to family members during the past year. Start a memory book, listing the most memorable happenings of the past year. Each year, add new ones. Make it a yearly tradition to spend New Year's Day filling up a photo album with photos and captions that capture the highlights from the past year. 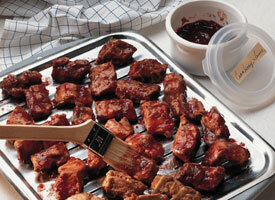 Prepare CRANBERRY BARBECUED RIBS, refrigerating as directed in Do-Ahead Tip. 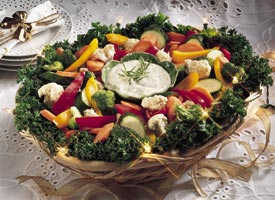 Prepare VEGETABLE BUFFET PLATTER; cover and refrigerate until serving time. Move cheese balls from freezer to refrigerator. Finish making Snowman Cheese Ball; store loosely covered in refrigerator. Reheat Cranberry Barbecued Ribs as directed in Do-Ahead Tip. 2. Mix ground beef, onion, bread crumbs, milk, egg, salt and pepper. Shape mixture into thirty 1-inch balls. Place in ungreased rectangular pan, 13x9x2 inches. 3. Bake uncovered about 15 minutes or until no longer pink in center and juice is clear. 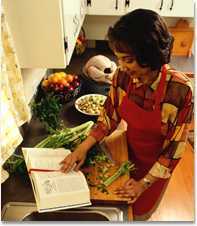 (To serve immediately, continue as directed in step 5--except decrease simmer time to 15 minutes.) 4. Place meatballs on ungreased cookie sheet. Freeze uncovered about 20 minutes or until firm. 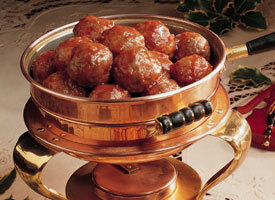 Place partially frozen meatballs in heavy plastic bag or freezer container. Seal, label and freeze no longer than 3 months. 5. About 25 minutes before serving, mix chili sauce, water, pasta sauce and mustard in 2-quart saucepan. Add meatballs. Heat to boiling, stirring occasionally; reduce heat. Cover and simmer about 20 minutes or until meatballs are hot. Partially freezing the meatballs before putting them in a plastic bag ensures that the meatballs won’t stick together and lose their shape when thawed. These meatballs don’t have to look the same the second time around. Crumble leftovers and stir into chili, pasta sauce or a sloppy joe or taco mix. 2. Place pork, meaty sides up, in single layer on rack in broiler pan. Cover with aluminum foil and bake 50 minutes. 4. Heat remaining cranberry mixture to boiling in 1-quart saucepan. Serve with pork. All holiday appetizers should be this fun! 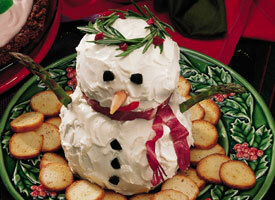 This adorable snowman is made of a delicious spread of seasoned cream and Cheddar cheeses. 1. Mix 3 packages cream cheese and the Cheddar cheese; divide into 3 equal parts. Combine 2 parts to equal two-thirds of mixture; mix in pesto. Mix onion, mustard and pepper sauce into remaining one-third mixture. 2. Cover each cheese mixture and refrigerate about 4 hours or until firm enough to shape. Shape each cheese mixture into ball. Wrap each ball, label and freeze. 3. About 12 hours before serving, remove balls from freezer. Thaw in wrappers in refrigerator. 4. Arrange balls on serving plate with smaller ball on top for head of snowman. Frost snowman with whipped cream cheese before serving. Decorate as desired. Serve with crackers. Store covered in refrigerator. You can make this cute little guy up to 1 month ahead! Guests may be a little reluctant to start sampling your delicious creation, so make extra to fill serving bowls to help get them started. Use your imagination to decorate this whimsical snowman! You can use fresh rosemary and dried cranberries (crown), chopped olive pieces or raisins (eyes and buttons), pimiento or red bell pepper (mouth), radicchio or carrot ribbon (scarf), and asparagus spears or celery sticks (arms). This colorful appetzer adds flavor and crunch to any buffet table. Served with a creamy butterrmilk dressing, these veggies won't last long! 2. Arrange vegetables in separate sections on serving platter. Serve with Buttermilk Dressing. Shake all ingredients in tightly covered container. Refrigerate at least 2 hours. Shake before serving. About 3/4 cup dressing. Make this appetizer even simpler by buying the veggies already cut up from your supermarket's salad bar section. No time to make the dressing? Any store-bought buttermilk dressing will do. This delightful mixture of favorite snack foods has a spicy chili powder kick. 1. Heat oven to 300ºF. 2. Mix popcorn, snacks, pretzels and cereal in large bowl. Mix remaining ingredients; drizzle over popcorn mixture, tossing until evenly coated. Spread in ungreased jelly roll pan, 15 1/2x10 1/2X1 inch. 3. Bake uncovered 15 minutes, stirring twice; cool. Store loosely covered at room temperature up to 2 weeks. Microwave Directions: Place butter, chili powder and garlic in 3-quart microwavable casserole or bowl. Microwave uncovered on High about 1 minute or until butter is melted; stir. Stir in popcorn, snacks, pretzels and cereal. Toss until well coated. Microwave uncovered 6 to 8 minutes, stirring every 2 minutes, until toasted; cool.